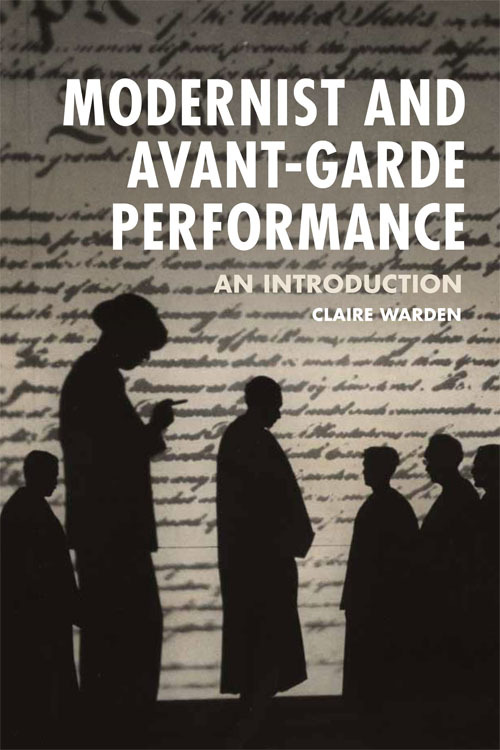 To extend a metaphor, Claire Warden’s new book Modernist avant-garde performance: an introduction provides a healthy reminder that one should never judge a book by its cover. Or its blurb. Or its format. Or, in fact, its declaration of intent. Because what this book does provide is a genuinely stimulating discussion of some of the most exciting performance practices that twentieth-century Europe had to offer, by a generous scholar with an infectious love of her subject. What it does not provide, however, is most of what is promised by its packaging and publication material. In a (perhaps economically understandable) bid to maximise the marketability of their product, Edinburgh University Press are promoting this as a textbook for students newly encountering the material, and tutors looking to enliven their pedagogies in suitably experimental fashions. Tailored to these audiences, the dust jacket proclaims ‘[t]he first detailed, student-focused introduction to modernist avant-garde performance’, ‘practical exercises at the end of each chapter’ and ‘links to performance-based explorations of theatrical techniques’. Unfortunately, there are manifold problems with these statements. For one thing, there are books in existence that serve as introductions to modernist, avant-garde performance. There is Contours of the theatrical avant-garde (2000), for example, which compiles a wealth of research from scholars like Philip Auslander, Erika Fischer-Lichte and Christopher Innes. There is also Theories of the avant-garde theatre: a casebook from Kleist to Camus (2013) which provides a compendium of writings from practitioners such as Maeterlinck, Meyerhold and Schlemmer, ideally suited to offer students first-hand exposure to these topics. For another, the ‘practical exercises’ and ‘links to performance’ are largely relegated to short text boxes at the close of each chapter, each containing basic classroom activities such as ‘write a manifesto for a twentieth-century theatre company of your own creation’ (p.41), ‘draw whatever comes into your head’ (p.69) or ‘create your own masks […] taking your lead from [Eugene] O’Neill’s stage directions’ (p.115). Whilst these instructions are perfectly serviceable, they hardly test the frontiers of education in line with the revolutionary intentions of their subject matter. Actually ‘new modernist studies’, as it is termed, is less about discovering a definitive way of understanding this art or applying overarching banners of meaning than it is about simply opening up the material and approaching it afresh (pp.8–9). This sentiment has more in common with Rancière’s anti-hierarchical belief that ‘the student must see everything for themselves’ (p.23) than with a self-proclaimed ‘textbook’. Warden is at her best when exploring those things that she finds fascinating about the European avant-gardists and modernists, rather than telling us why we should like them. In her second chapter, ‘Performing modernisms’, for example, her writing properly takes off, sprinting through a kaleidoscopic terrain of surrealist prose-poems, futurist scenography and expressionist paintings with irrepressible glee. Such is the enthusiasm Warden displays for her subject that both writer and reader are encouraged, momentarily, to forget the book’s pedagogical affectations, and engage instead in a deeply agreeable exploration of ideas. It is not at all ironic that Warden is a better teacher at those points where she stops directly addressing the reader as a student, and settles into her own intellectual excitements with unmitigated relish. As a scholar of the European avant-garde, she is presumably more aware than most that inspiration is not well served by didactic instruction. One of the book’s other highlights is a chapter entitled ‘The modernist body’ which traces the roots of contemporary scholarly investigations into embodied performance back into the activities of the European avant-gardists. Meyerhold’s celebrated ‘biomechanics’ are given respectful attention, as are Craig and Jarry’s disparate investigations into the marionette. For me, the most notable point is a short section on ‘Death and after death’ that examines the emergent paranoia of robots replacing humanity, complete with grisly accounts of Karel Čapek’s R.U.R. and Elmer Rice’s The adding machine. As an undergraduate student, these would have provided a strong impetus to further study, which actually does fulfil the final pedagogical boast itemised on this book’s dust jacket. It is a shame, then, that whoever was responsible for the presentation of this book did not take more heed of the nature of Warden’s project. Again, in line with Rancière’s notions of ‘emancipatory’ education (1991), the ways in which this book may best serve students is not as a teaching aid but as an accessible and engrossing study of an (it must be said, impressively broad) set of cultural and artistic practices. As for tutors, it may well be that some find the exercises and points for reflection at the end of each chapter to be useful aids when planning their classes. Personally though, I suspect this book would be more productively employed in tandem with exercises that offer greater opportunity to ‘open up the material and experience it afresh’ (p.9)—an obvious candidate would be Tim Etchells’s endlessly subversive Certain fragments (1999). None of which is to say that this book should not be given to students. It should. It is an excellent introduction to a fascinating subject. It just needs to be disentangled from its packaging. Cardullo, B. (ed. ), 2013. Theories of the avant-garde theatre: a casebook from Kleist to Camus. Plymouth: Scarecrow Press. Etchells, T., 1999. Certain fragments: contemporary performance and Forced Entertainment. London: Routledge. Harding, J.M. (ed. ), 2000. Contours of the theatrical avant-garde: performance and textuality. Ann Arbor, MI: University of Michigan Press. Rancière, J., 1991. The ignorant schoolmaster: five lessons in intellectual emancipation. Trans. K. Ross. Stanford, CA: Stanford University Press. Sam Haddow is a lecturer in contemporary drama at the University of St Andrews. His research interests include twentieth and twenty-first century political theatre, historiographic theory, and the intersections of politics and performance.